Just what I always wanted. A big bad truck, more powerful than any others, sound echoing through the wilderness at my arrival but with a perfectly quite, air conditioned interior of leather seats and crystal clear audio. And now I have one. It's only a 150 for economy. To get better economy, I put bigger wheels on so that every time the engine goes around I'll go a little further. By not actually needing roads, I can shorten my commuting by taking more direct routs. And it's funny, but maybe there is therapy to be had in pretending. Wanting something enough to put in the time to create a full mental construct. That is what I do with schematic design. I dream up ideas that solve problems, I render them and encourage through discussion, drawings, models and presentation, my clients to 'live it'. Walk through the doors. Sit at the table. Look out the window. And so my practical side won't let me have a truck like this. But I can pretend, without expense to the environment or myself, that I have a giant one ton diesel truck workhorses jacked up and rendered useless for hauling or towing or even longevity because I've tricked it out to be fast, noisy and destructive. I admit--I wish I could justify a truck like this-the luxury of pushing around 8,ooo pounds of steel with a motor that's wastes 80% of it's embodied energy, just to impress my clients. But allas, I continue to strive to get closer to sustainability and when the Europeans have an average consumption of 116 gallon per year per capita, I just don't think I'd be happy with my truck parked 350 days a year. But armed with the power of unlimited immagination, I can experience this ego-building sensation too. It weighs only 5 lbs (my truck, not my ego). At one tenth scale (the wheels then being 54" in diamter and the fuel tanks each hold 92 gallons), it's just big enough to be a funormant for my truck. That's a hood ornament you can have fun with! Left-I particularly like that the wall was partially sided allowing the Vycor flashing to shed any water that may come down/through/around the window (don't forget about condensation) well out over the moisture barrier to the weather face of the shingles. Before I ever place a window, I like to make sure the sill and the framing are protected. On commercial projects quite often a soldered pan is used with an up return on the inside, positive slope to the outside and appropriate counter flashing. Considering the 52" overhang just 4' above on Lois's house, I thought this combination of tar paper (30#) and Vycor was more than sufficient. Left-The 'butterfly'. A simple strip (cut from scrap or end of roll) that is stretched out to seal up the pinhole in the corner left, no matter how carefully you did your tar paper and flashing. Right-Joe demonstrates his excellent eye sight and attention to detail as he places the Milgard aluminum window. Once the window is installed and level, we nail or screw it off, depending on siding/trim details. Don't nail the top because when the building moves/settles, you don't want your glass to break. Then, the primary waterproofing is applied to the bottom first, then the sides. This is a piece of tape that seals to the continueous flange of an aluminum or vinyl window and goes beyond the holes that will be made nailing up the trim. Then the top flashing would be installed- however in this case (see part 1) there was no need. Right-Joe applies the primary waterproofing, pealing back the paper as he goes and working in the direction of gravity. The shingles will be fit directly up to the aluminum window which has about a 1- 1/4" protrusion from the sheathing. The shingles at their thickest are only 7/8". I wouldn't normally use shingles (never on a roof) as I prefer my old growth cedar standing. But in small amounts, in the right places (here matching existing), they can be very effective. With the overhangs, these shingles will look good and protect the wall assembly for 50 years easy. Left-Joe performs two tests simultaneously. One, demonstrating how to peel the paper off the Vykor, the other looking directly at the flash so we could test the red eye on my new Panasonic Lumix. Being a designer by nature has disadvantages. One being it's the primary or eventual topic of nearly every conversation I engage in. As a result, here I sit on x-mass morning with the great company of friends and family, having the morning dedicated to nothing in particular, and I decide to do a blog posting! This is of a window wrap I recently did. There are as many ways to try to water proof a window as there are manufactures of windows. Water damage is a huge concern making up the bulk of architectural law suits. Poor drainage, rotting walls, mold, wet insulation and eventually stain and mildew on the inside surface of the drywall and pealing paint on the outside can cause the home owner and the builder grief if not properly handled at the time of construction. Code's have been adopted relating directly to this issue. You're now required to tape all openings (framing to moisture barrier) prior to window installation. This helps, but all the tape and tar paper in the world won't guarantee a water proof window or dry sheathing. This comes from proper detailing based on construction types and materials and skilled assembly by someone capable of being a drip -- of water! One must be able to trace, in their mind, the drip of water down the siding, to the top of the window, around the corners, down the sides to the sill and hopefully back over the siding or primary moisture barrier. Top- the top of the window needs no flashing as it's tucked up under a 2x piece of trim. 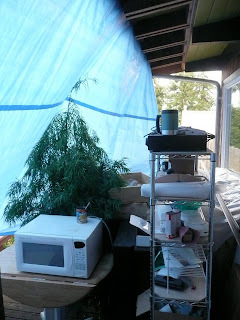 It's also under a 52" eve/overhang so is protected from direct water even on the lee-ward side. Right-Joe of dbBrad pulls the 30# (I don't believe 15# felt is of value. It's thinner, wears out more quickly and seems to be less saturated with resin and is about 80% the cost-not much savings for far less protection) paper taut and staples it into the opening, trimming remainder. I like to do this after the paper has been up, wrinkled, stretched, shrunk, etc. If the tar paper is at all pooched, it can hold off the window, siding and trim. In this case, I chose to shingle the wall prior to window installation as Milgard needed 6 weeks to get me an aluminum window but progress on the wall needed to happen. For remainder of water proofing details, see Window Wrap 2. We like to have fun. Here, prior to the grueling task of sanding and finishing the floors, we take a moment to enjoy our work, the beautiful wood grain of cvg fir, and the wonderful dwelling we're creating for Lois. Joe, always a pleasure to have as an employee, demonstrates again his ability to perform almost impossible tasks. Some days seem more impossible than others, but we try to have fun on our job sites. Break being over, he rapidly returns to work! Just some random shots by me, Brad Hankins of dbBrad during the cold week we had early December. I recently purchased a Panasonic Lumix with the Leica 10x lens and love it. I'm enjoying photography again for the first time since taking 3000 slides in Europe and not knowing what to do with them! These photographs are of ponds frozen, bubbled, drained, frozen again and again over several cycles until the ice seemed to capture a network of bubbles, leaves, rocks and layers frozen in time. Above: a rock and plants captured in the ice, macro. Right: concentric circles in plan view, puddle anywhere. Here the bubbles are the same ones I pondered over this summer in the FrEdLey pond, wondering if fish, decaying leaves or some other biological process was the effects of a few bubbles a minute trapped in time. And the Best bubbles yet, compliments if John and Re-Assemblage. A process of finding, assembling and distributing, for a cause, recycled objects disguised as art. Below: Fran and Ed of FredleyonWhidbey.blogspot.com are the proud foster parents of this piece. 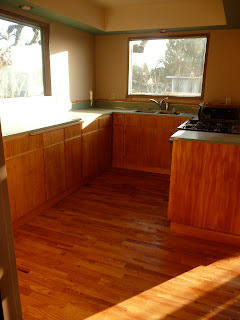 Getting the recycled fir flooring laid, cabinets set in place and shelves built happened just days before the floor was sanded in a huge push to get Lois semi-functioning in her home again. In the meantime, her furniture is piled in the garage and her bedroom, outside, and where ever a space was available so the floors could be completely empty for refinishing. Just like a jigsaw puzzle trying to get all the pieces to fit perfectly. The wood for the beam and shelves is recycled. 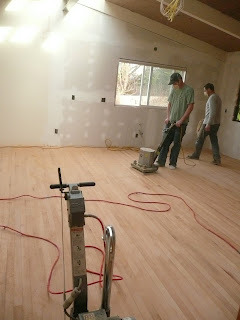 The old recycled fir flooring (from Re-Store and Second-Use) has been cleaned up; installed; sanded; and is now being finished. Quite the transformation! Once an uninteresting house with small rooms, many walls, and carpeting is still a small house, but a house-with-drama. No extra square footage was added, but wow! it now feels spacious, inviting and interesting. The room in this first picture will be Lois' studio, where once it was two tiny bedrooms and without the French doors. 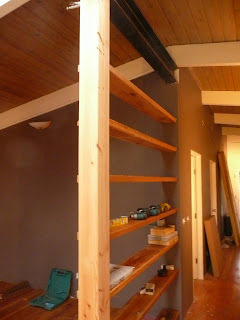 In the second picture the space (freshly sanded) was once the living room and kitchen with a wall in between. It also had a strange area of wasted space (pictured above to the right of the door ) that will now be a small sitting area with propane heat stove and large flat screen TV -- a place to hunker down on a (though the materials aren't) and have transformed the space. When the new door, 40" x 7'-0" tall hand made single lite by dbBrad is finished it will bring in yet more light. Matt and Joe sanding the studio. The kitchen/living area partially sanded. Just beginning the sanding in the studio. Not so long ago, we did a post on cleaning up flooring. 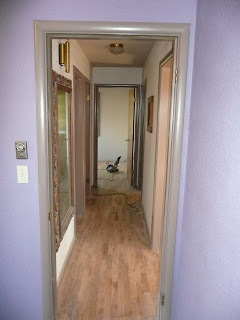 See Cleaning up flooring and New flooring under Client Projects - Lois Remodel, for more. The wood, though beautiful, grain perfect, long and straight Douglas fir of the type not really available anymore, was rougher than I thought. And dirtier. It required a lot of cleaning where the old cracks were and as a result, we jointed the grove side of the boards to 'crispify' the face and edge. I chose to do nothing on the groove side to avoid re-milling the flooring from scratch, which wasn't in the budget. As it is, the floor has already taken longer than anticipated for both clean up and installation. Those long skinny 2.25" boards just don't cover very quickly. All in all, I've been worried that the cost might be too high. But then, the quality of the floor Lois is getting is amazing. 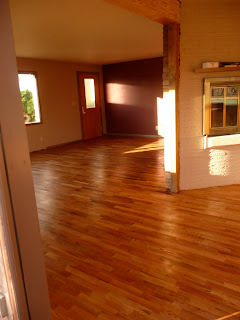 A superb floor from beautiful, old wood, but not inexpensive. It's probably about $10/sf all said and done. 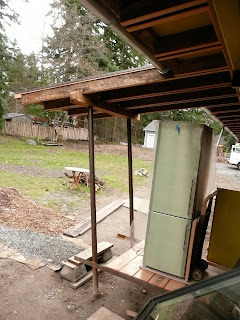 It's also not perfect, being old and recycled and installed on a sub-floor with less integrity than those I build. A squeak here and there but absolutely exquisite, with that old material patina. But now I have an out for a squeak or a dip or a groove. Warranty--VOID--thanks to the cup of tea Lois spilled on the floor!! Here are my two favorite Makita circular saws. My first saw ever was a Hypoid, but it's power oriented for hacking wood. I like a lower center of gravity with a more positive if not less aggressive saw for stability and cleaner cuts. Even for framing-if you're going to cut a piece of wood, might as well do it right-safe, square, clean and enjoy the process. The 5.25" I purchased over 20 years ago for about 120 dollars. This was almost as much as the more common 7.5" saws back then. This little guy now sell for about 250 dollars when you can find one, about twice what the average circular saw is going for. But you only need to ever buy one because they just go and go and go. I hope to get the same longevity and rock solid performance from my new and 16" big bad beam saw. make a 7-8" saw that's worth a damn. So I gave up on a mid sized and started looking at 10" saws. Only one, Milwaukee, and it's got to be the worst design I've ever seen. Just inspect the foot/saw attachment and adjust it. ToolTalk-On the little saws, most people make a little hook with about 12g stiff wire and run it through the eye on the top of the foot that hinges it to the saw. The little hook, about an inch from the base, catches the flat part of the guard in the open position and holds it. I'm going to have to do something like this for the big guy which is a little scary. There's a lot of blade showing with the guard up and with a 7.5 " depth of cut (at 90) that's just about enough to get through my entire leg. Ah, but at least I could design and build a better leg than that clunky think of Mr. hooks! 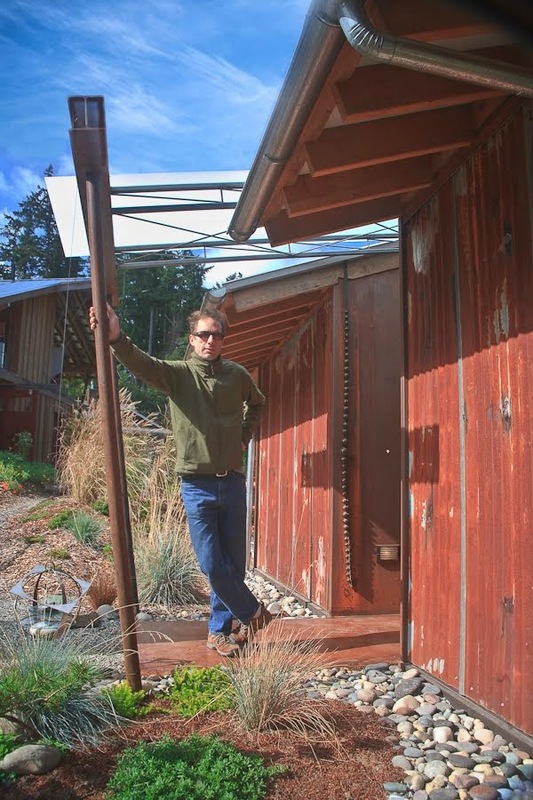 For Nick, the owner of this unique building in Freeland, Washington, I designed a carport/shop building, and drafted a semi-resolved set of schematic* drawings for permitting with the County. It was a 5 page set drawn in 1/8" and 1/4" scales, engineered and permitted for less than $2,500. I'm a believer that schematic design not only makes a project more affordable, building something without having studied the implications and drawn a solution is an absolute waste of time and money. However, a full set of drawings would be far more expensive. I'm also a firm believer in the design build process, that a designs' details can evolve with the project and by doing so saves money up front not having to spend endless hours resolving and drawing details that skilled craftspeople don't need and bad contractors can't read. Sometimes in looking at design and budget, people loose sight of the fact that without an experienced builder, the schematic plan's intent can be compromised. My designs express a language of materiality, form, function and connectivity. It can be very suggestive but vague at the same time. Nick and his Son who lives in Pt. Townsend spend a few hours cleaning up two faces on the 24' beams-left. I, as a designer, would like to participate in construction management and detailing all through the project, but such is not always the case. Nevertheless, with a good road map and a clear set of ideas, many builders can interpolate, extrapolate and formulate a plan meeting 90% of the designer's original goals. 90% gets an 'A' in college! A schematic design does not detail every connection nor draw every section or even deal with every issue. Throughout construction there are numerous issues to be dealt with on a day-to-day basis. 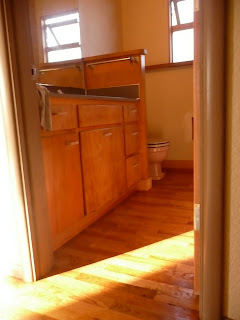 (Note: This can be true of any design, large or small, new or remodel.) On this project, a problem with the stairs lacking enough head clearance was simple overlooked. In my mind, the stairs were to be simple attic stairs not to a 'habitable space' thus not needing to be code. As the design progressed and the upstairs became a room with future uses, stairs needed to be re-evaluated but there wasn't time given the budget. Normally, I catch issues like this during construction or project/construction management. More and more I feel that though the schematic design is the most important first step, expertise on site during the entire process is equally important. Joe checks his placement for the 6x6 post brackets we were using for the stair footing detail. As a result of the mishap, some steel brackets had to be cut off and re-welded and the design of the stairs had to change (always an opportunity to improve). I'm thrilled that Nick brought me in to resolve the problem which was tricky and didn't want to resolve with out mess and clutter. The completed stairs do not look like an afterthought. Not only do they appear as though there was never a problem, they're better than those I'd originally anticipated. Quickly on construction, the stairs should be good for 50 years. The treads are pressure treated 3x12, also called dock wood. Not organic, safe to say even toxic, but the treated wood was required to deal with their exposure to the weather and their longevity reduces waste in the long run. The pitch of the stairs is very close to that of the roof, a 6 / 12. The beams were treated prior to assembly with a Daly's product. Even though they're under the 48" overhand, they will still see a fair amount of weather. At the top the stairs are bolted and so cannot slide or shift. This means at the base, a simple load bearing detail was sufficient (no lateral load). Instead of doing a landing or concrete pad, I chose to float the stair bases on little 6x6 post brackets and let the existing walk/drain gravel do what it would. *schematic means a design that is symbolic or simplified. The grass is greener over there. I believe this same phenomena accounts for why a sandwich with the exact same ingredients tastes better when someone else makes it. Green grass is the American dream. Except for here where we wanted weed free planting beds. In the top soil we got from a local supplier there were grass seeds. Now that we've used 20 yards to mulch areas of the front yard, we're going to have to cover with cardboard and mulch again. Alternatively, since the grass is tiny with small roots, it can be disturbed with a rake or hoe so it doesn't get a foot hold. For Lois, the dead grass across the street looks better than the live grass in her newly mulched yard, showing that even when the grass here is greener, it's still not as green as over there! The idea of a heat sink isn't new. What really spurred my interests was the amount of surplus heat generated during summer production of an over-sized system. To heat when it is cold and the available solar insolation is low, requires more collectors at different angles than those capturing hot water for a free summer shower. This extra heat is typically written off and shunted to greenhouses or swimming pools. In designing a solar system to meet heating requirements for spring and fall equinox, the amount of summer surplus was greater than the heat I needed all winter long. I wanted to capture this heat. So began the quest of an economical way to store low grade energy for months on end! Specific heat is a material's ability to hold energy. By definition, the specific heat of water is 1, meaning it takes 1 BTU to heat one pound of water one degree F. If you have a 5 gallon bucket of water and you raised the temperature 50 degrees F, you'd have added about 2000 BTU's. Sand, tightly packed with all different sizes of material (fine/coarse/platelet/round) will have a specific heat of about .22. Water holds 5 times that of sand by weight. Clearly water is a better storage medium. It also has the advantage that it's easy to move that heat/energy. However water does have the disadvantage of being a liquid. It wants to leak, run, create pressure and evaporate or freeze. As a result, storage will run you about $1-$1.50/gallon minimum. Steel has a high specific heat because of it's density, but also has much higher conductivity. This means that heat within the steel mass will be evenly distributed not allowing a core to maintain more heat but transferring this heat to the outer edges for more rapid loss. The other problem I found is that people who deal in old cars and scrap really don't take well to questions. I suspect there are some serious EPA logistics to be considered prior to the use of metal. Really, there is so much embodied energy in steel it doesn't make sense to bury. I've heard talk of using PCM (Phase Change Materials),a substance with a high heat of fusion that attempts to change phases storing massive amounts of heat in the process. Wikipedia suggests 5-14 times the storage of other medium like water and sand. Salts are the inorganic version to nature's organic fatty acids, also a PCM. Transferring heat, controlling crystallization and getting a permit to pour a slab on top of 3' of a material not currently stocked by Home Depot are the problems here. 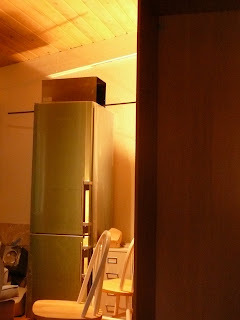 is the most efficient means of storing heat is in grain. With livestock living a happily confined life in a crawl-space, humans would have only to dump grain into the pit and receive heat and fuel in exchange. No need for a beef freezer either. Natural Gas which could then be used for cooking or generating electricity. Finally, the high grade manure could then be used to fertilize plants for food production . Perhaps the future of public housing could be doubled up with dairy's and beef yards where the people live over the animals, just like civilization pre-industrial revolution! While these solutions are all worth further exploration, the best way to create power for the future is to not use so much now. Conservation is the easiest and most satisfying step towards reducing our consumption, so turn the lights off. All images compliments of Googles Image Search, one of the best tools on the web for graphic conceptualization. When I first decided collecting data would help defend against scrutiny, I had no idea it would be so complicated. The idea of what I now call thermal ballast isn't new but like so many good ideas, without science it's guess work. Common Americans are hesitant to spend money on guesses. I believe in sustainable and the need to revise our collective way of thinking/living, so bring in the science! Brad Hankins aka dbBrad and Ben lay 3 more sensors in the top layer of sand. Two sets directly under these and one more set above in the slab. 12 total here in the heat sink. I'd had enough of an electrical background to have an idea what a thermocouple was. So brilliant and simple, anyone could use it. Just get the right two materials, the right kind of wire, eliminate interference, static, signal drop and deterioration, do not have any solders in line and keep all your runs the same length was just some of the advice I found. Not so easy really. Design Build means when you can't do it, you find someone who can. On a blind call from the phone book I was pleased to find Don Colvin of Mukilteo. He found some off the shelf sensors with stainless steel casings and was able to re-solder them maintaining direct burial specifications to better, tougher CAT V line, test and record an offset (a primitive accuracy improvement based on a constant temperature oil bath). This would have been a good time to calibrate the sensors too, but with a full crew and a big tractor on site, the sensors needed to go into the ground. Interested in the notion of an Annualized solar storage system, Don Colvin even delivered the sensors. The sensors have bee n buried for a while now and all that is left is to automate the process of collecting data and interpreting it. I'm surprised at how complicated it is everytime I go through the logistics. It seems overwhelming and when I put it down for a while, it seems so simple again. As a result, to date, data has only been collected manually, a tedious process of hooking up a gizmo with a 10 microfarad resistor, a nine volt battery, 4 terminals and an ohm meter. Resistance may be futile (Borg) but its also equates to temperatures. The trick is to automate the system to collect data on a specified frequency. Besides being more accurate (no human error) it also gives us the chance to take extra readings, throw away anomalies and average other readings and store this information. The computing power is minimal so I intend to use an old machine (windows NT). My energy conservation side doesn't want it to run all the time either. Lab jacks are a component recommended by Don that will manage 8 senors each. More sensors means more lab jacks. We went with 24 sensors and will need three labJacs. We'll also use LabView to manage the labJacs. Problem include: the old computer only has two usb ports, I'd like the machine to turn on and off but this requires another piece of software and a system more prone to failure, The new versions of LabView may not work with Windows NT, and we can take readings as often as we like. But as an example, 24 sensors, 24 hours a day, 365 days a year over say a reasonable 10 year study is 2,102,400 numbers to look at and cross reference. At this point there is far more data than sense. We need a data/sense converter in the form of an algorithm, a way to process the data and hopefully represent it in a graphical manner relative to the sensors, insulation, weather, heated space, etc, to try and understand where the heat is moving and how much heat is making it into the dwelling during the heating season. I suspect I may be looking at stacks of printouts looking for highs, lows and numbers that don't make sense. Maybe the great idea and data will spark interest from a clever graduate student with access to a big computer! In the mean time, I can measure probes of curiosity when I want to with the gizmo. One thing this has let me see is that the sandy soil here changes temperature quickly, responding to the temperature of the sky and the rain that falls out of it. Cold rains can cool the soil instantly several feet down. It's not uncommon for a 44 degree F. value to be 5' underground. This summer, sand 4' down was at 65 degree's F.
Brad's new dbbrad promotion signs are up on the Lois Remodel project. Kitchen, hallway, bath and living room floors after sanding, with all the photos showing the new stain except for the hallway.